Short hairstyle has been the most popular one in Celebville for a long time and many beauty bunnies changed their image from lovely dolls with long hair to lady seductresses with super short hairstyle. 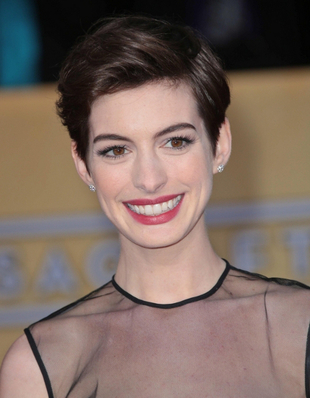 One of the latest celebrity makeovers that captured everyone’s attention was Anne Hathaway’s short haircut that became the topic of discussions immediately after her role in ”Les Miserables”. 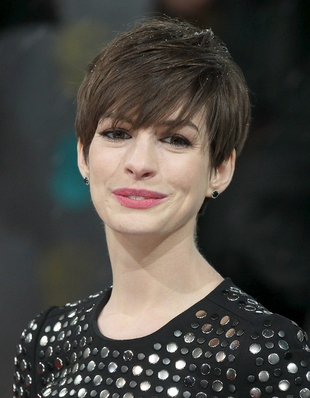 No one could say that Anne would look so feminine and gorgeous with short pixie haircut. Surely she had changed her image before but she’d never done total makeovers. 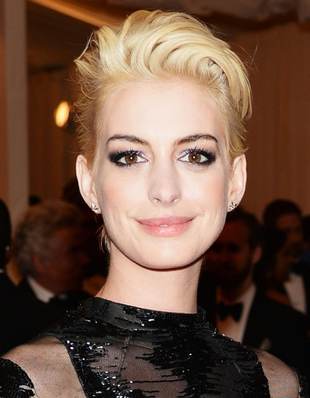 With her vintage pixie haircut began new era of short styles and millions of women got inspiration from Anne Hathaway’s new short hairstyle. You can also get a dose of inspiration from her pictures. 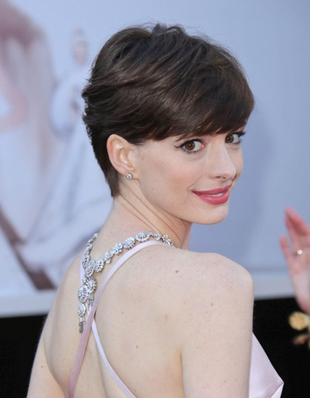 Anne Hathaway’s new image got so much appreciation that as a result her new image was voted the most iconic haircut of all times. Really impressive isn’t it? When we first saw her wearing new haircut it was short pixie with longer layers on the top. Such haircut was in perfect harmony with her soft facial lines. She kept her natural dark brown hair color and I should say that she looked impressive. Few months later she made another boom when she stepped on the red carpet as blondie. Her transformation got both positive and negative comments from style critics. The contrast of her natural brown eyebrows and light blonde hair was smashing and she definitely succeeded to stay in the limelight. After her shocking makeover Anne Hathaway got back to her natural dark brown hair at this time with a bit longer layers on the crown.